Your mosaic dataset will probably be composed of many raster datasets, which can have significant color differences. You can apply a color correction to your mosaic dataset to create a seamless looking mosaicked image using the Color Correction window. This window is added through ArcMap's Customize dialog box. There are three sections in the Color Correction window: the layer list, Color Balancing options, and the Excluded Area sliders. The layer list allows you to select the active layer to which the options you modify in the window will be applied. The Exclude Area sliders allow you to choose which pixels to exclude from the color correction algorithm based on their colors in the display view. The Color Balancing section allows you to choose which color balancing technique to use. The Color Correction window does not appear on the interface by default. You must add it to the interface from the Customize dialog box. 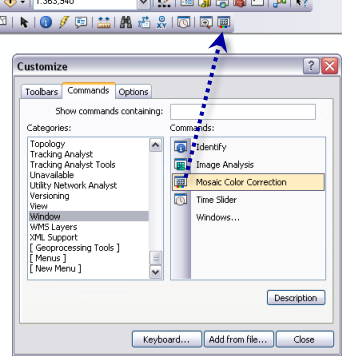 The Color Correction window is only available in ArcMap and only works with mosaic datasets. In the Categories list, click Window. In the Commands list, click Mosaic Color Correction, then drag and drop it on any toolbar, such as the Tools toolbar. Click Close, to close the Customize dialog box. Click the newly added Mosaic Color Correction button , to open the window. To make your mosaic datasets look seamless, you need to choose a color balancing option. There are three color balancing options available: dodging, histogram, and standard deviation. This technique changes each of the pixel values towards the target color. If you choose this method then you must also choose the type of target color surface to use, which will affect what the target color is. Dodging tends gives the best result in most cases. This technique changes each of the pixel values according to the target histogram. The target histogram can be automatically calculated from the mosaic dataset, or a target raster can be specified. Histogram balancing works well when all the rasters within the mosaic dataset have a similar histogram shape. This technique will change each of the pixel values according to the standard deviation calculation. The standard deviation value can be automatically calculated from the mosaic dataset, or from a target raster. Standard deviation balancing works best when all the rasters in a mosaic dataset have the same histogram distribution of the normalized values. If you choose the dodging color balancing method, then you must specify the color surface to use. Below is the list of color surfaces that are available. All the pixels are dodged towards a single color point, which is the mean. A single color surface works well when there is a small number of rasters in the mosaic dataset that have only a few different types of ground objects. If there are too many rasters in the mosaic dataset or there are too many types of ground surfaces, then the output color may become blurred. All the input pixels are dodged towards a multiple set of points, which are distributed all over the mosaic catalog. This produces a good output when there is a large number of rasters in the mosaic dataset, or areas with a diverse number ground objects. All input pixels are dodged towards many points which is obtained from the two-dimensional polynomial slanted plane. This is similar to a Color Grid surface, but takes more time to process, and tends to produce a smoother color change. All input pixels are dodged towards a multiple set of points, which is obtained from the two-dimensional polynomial parabolic/hyperbolic/elliptical surface. This is similar to a Color Grid surface, but takes more time to process, and tends to produce a smoother color change. All input pixels are dodged towards multiple points, which is obtained from the cubic surface. This is similar to a Color Grid surface, but takes more time to process, and tends to produce a smoother color change. Before color correction can be applied, make sure that statistics have been calculated on the mosaic dataset—especially if any functions have been added at the raster level. Use the Build Pyramids and Statistics tool and make sure that the Calculate Statistics checkbox is checked on. In the Color Correction window, select the mosaic dataset layer that you would like to color balance. Optionally, click the Stretch drop-down arrow and select a contrast stretch, which will be applied before any color balancing takes place. Pre-stretching can be performed on each raster within the mosaic dataset before any other color correction takes place. This means that color correction process will be applied on the stretched pixel values for each raster within the mosaic dataset, not on their original values. Optionally, type value in the Gamma text box. Optionally, check the Mask check box and click the drop-down arrow to select a mask. A mask is a raster dataset (or other mosaic dataset) or a raster layer created using the Excluded Area options (described below), which is used to exclude pixels from the algorithm. If you create a raster dataset to use as a mask, the mask is defined by NoData in the raster dataset. Therefore, the pixels defined with NoData in the mask will not be used in the algorithm to perform the color balancing. The mask must exist as a raster or mosaic dataset layer in the table of contents. Optionally, check the Target check box and click the drop-down arrow to select a target raster. A target raster is a raster dataset or mosaic dataset that you want the color balanced mosaic dataset to look like. 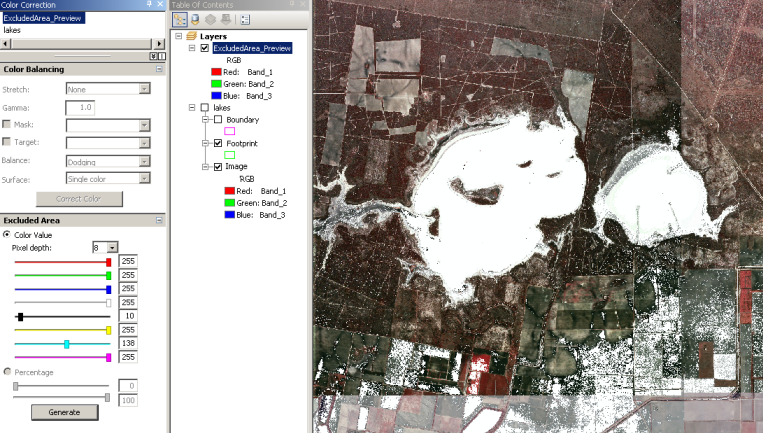 The target raster must exist as a raster or mosaic dataset layer in the table of contents. Click the Balance drop-down arrow and select a balancing method. Optionally, click the Surface drop-down arrow to select a surface calculation method to use when using the Dodging balancing method. Click the Correct Color button to run the color correction. This will take some time. Once complete the mosaicked image will be updated and you will see the corrected image. You can make modifications in the Color Correction window and run the color correction process until you achieve the results you desire. If you need to remove a color correction, right-click the mosaic dataset in ArcCatalog or the Catalog window and click Remove > Remove Color Correction. The Exclude Area section of the window allows you to create a mask which will be used to exclude pixels from the algorithm used to color correct the mosaic dataset. This functionality is optional and is not always necessary to use when color correcting your mosaic dataset. An exclude area is created when there are areas that are very difficult to correct and you don't want the algorithm to be skewed by such troubling areas, such as areas of water or clouds. As well, areas on either extreme of the pixel distribution—very low pixel values and very high pixel value—tend to be trouble areas for color correction. You can exclude areas based on color or by the histogram distribution percentage. If you want to exclude areas based on color you will select the Color Value radio button and use the activated options. If you want to exclude areas based on the histogram distribution percentage you will select the Percentage radio button and use the activated options. The Generate button is used to create the exclude area layer. The layer that is generated is the areas that you would like to include as your target. If you would like to interactively see the exclude areas that the slider bars are excluding, while you are moving the sliders, then you can generate an exclude area layer before you change any of the sliders, and then you can choose that layer to adjust the exclude areas. There are eight color sliders that you can adjust: red, green, blue, white, black, yellow, magenta, and cyan. Each of these sliders can be used to create a layer, which specifies which pixels to exclude in your color correction result. The scale range is based on a 0 to 255 pixel display scale, no matter what your bit-depth is. Be sure to adjust the drop-down to the proper bit depth level, so the application can scale down the values properly. As you move the sliders you will see a mask created over the pixels that appear in your displayed mosaicked image that resembles the color of the slider you are using. You can exclude areas based on the low and high tails of the histogram distribution. There are two sliders available, the first one will exclude the low portion of the histogram distribution, and the second slider will exclude the high portion of the histogram distribution. In the Color Correction window, click the raster dataset or mosaic dataset layer that you would like to use to define the exclude areas. This will create an excluded area layer, which will be added to the table of contents and the window's layer list. In the table of contents, check on the newly generated exclude area layer and uncheck the mosaic dataset from which is being color corrected. Only the generated excluded layer can be visible in the display view. Click either the Color Value radio button or the Percentage radio button. Move the sliders to exclude the areas that you would like to remove, when you color correct your mosaic dataset. When you are satisfied with the excluded areas, you can move on to the color balancing task.